Did you know that spending time in a forest activates the vagus nerve, which is responsible for inducing calm and regeneration? Or that spending just one single day in a wooded area increases the number of natural killer cells in the blood by almost 40 percent on average? We've all had an intuitive sense of the healing power of nature. Clemens G. Arvay's new book brings us the science to verify this power, sharing fascinating research along with teachings and tools for accessing the therapeutic properties of the forest and natural world. 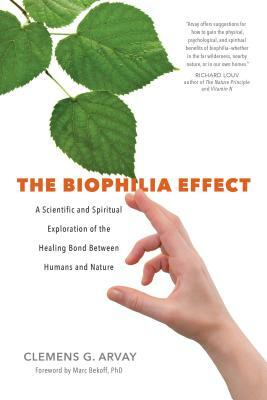 Already a bestseller in Germany, The Biophilia Effect is a book that transforms our understanding of our interconnection with nature--and shows us how to engage the natural world wherever we live for greater health, inspiration, rejuvenation, and spiritual sustenance. Clemens G. ArvayClemens G. Arvay, MSc, is an Austrian biologist who studied landscape ecology at Graz University and applied plant sciences at the University of Natural Resources and Life Sciences in Vienna. Arvay examines the relationship between humans and nature, focusing on the health-promoting effects of contact with plants, animals, and landscapes. The author also addresses a second range of topics that includes ecologically produced food along with the economics of large food conglomerates. Clemens G. Arvay has written numerous books including The Biophilia Effect. More at clemensarvay.com.